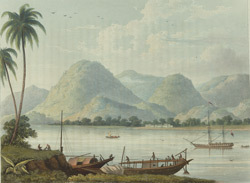 This is plate 5 from Charles Ramus Forrest's 'A Picturesque tour along the rivers Ganges and Jumna, in India'. Forrest was an East India Company official who made excursions along the rivers, producing drawings "attentively copied from nature, and in many instances coloured on the spot, ... while the magic effects of the scenes represented were still impressed on [his] mental vision". On the 2 December 1807, he set out from Calcutta with a British diplomatic legation. After 20 days, the Rajmahal hills came into view. Forrest writes: 'The Rajmahal hills were now very close to us and presented a beautiful sight ... They are clothed with wood apparently throughout almost their whole extent ... I took a small boat this evening, and rowed out to some distance from the shore, to obtain a better view of the hills, and judge more accurately of the height. Several very beautiful breaks offered tthemselves as the sun sank behind them." One of the "most picturesque" is represented here.